We manufacture, supply, install and commission all types and sizes of overhead electric traveling cranes. 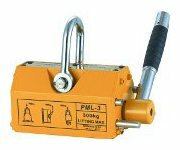 The permanent magnetic lifter can be used in a variety of industries for the transportation and lifting of steel, engine parts, semi manufactured goods and moulds. The magnetic lifters maximum lifting force is 3.5 times greater than the rated lifting capability. The capacity of the lifting magnet is determined by the thickness and surface quality of the component. Before operation, it is necessary to determine the percentage of the steel thickness or the component and capacity curve. If the component’s surface roughness (Ra) is less than 6.3 um, the magnetic lifter surface gap will not exist and the lifter gap should be estimated.